← “The Hispanic Hoodie Bandit” Strikes Again! See that picture? That’s a screenshot of from The Daily Beast, and that’s huge pile of crap. A gigantic misrepresentation of San Diego. 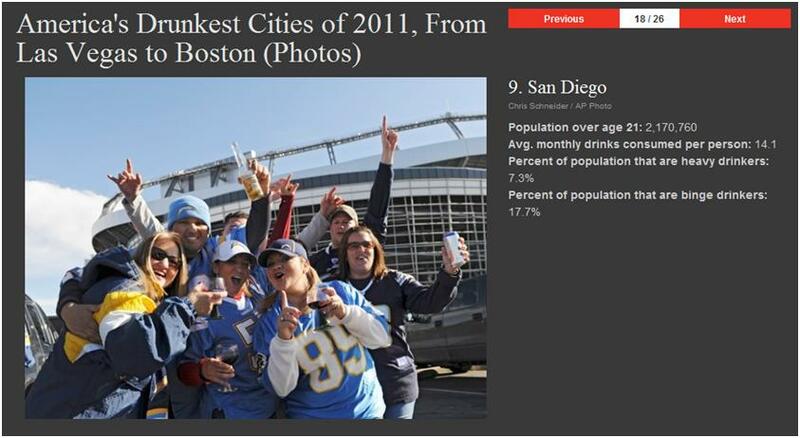 Propaganda from The Daily Beast that named San Diego the ninth drunkest city in the U.S. The 9th drunkest, huh? That’s respectable, you can see the stats on the right there. The average San Diegan will drink 14 drinks/month, and about 7% of adults in the city are considered heavy drinkers, with 17.7% being “binge” drinkers. Seems a bit subjective. If you’ve spent any time in PB or the Gaslamp, you agree these numbers seem shockingly low for our city. Here’s where the pile of crap part comes in…. the photo up top. Click to enlarge. Serious with that? Who are these people? San Diego is full of hot chicks, and I just don’t think that photo accurately portrays our lovely ladies. All frumpy and sweatshirted out. Why are they so cold, I wonder? Oh, I don’t know… because that’s in FREAKING DENVER. Fellow lobster, Van Diesel, helped me investigate this photo because that’s obviously not the Murph in the background. Nope. 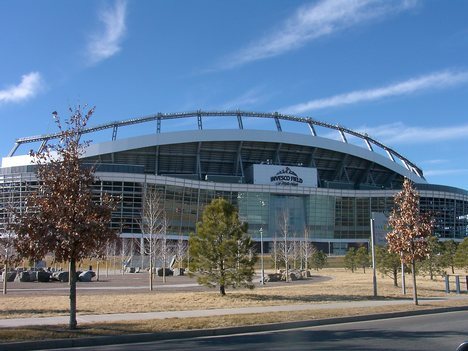 That’s Mile High or Invesco or whatever the hell the donkeys call their field. No wonder they’re so damn cold. Awesome. Call us a bunch of drunks and then don’t even put a picture up of us in our own city. Real cool, Daily Beast people. Worst representation ever. Don’t even get me started on the fact that these chicks are all drinking red wine in glasses at a tailgate. Boston got no. 1. Makes sense, zero sports in that city, so they just drink out of boredom. The bigger question is this: how is Vegas only no. 15 on this list? I’d have put money on top 5…and, apparently, I’d have lost. This entry was posted in News and tagged gaslamp district, San Diego, san diego is drunk, san diego ninth drunkest city. Bookmark the permalink.